Samsung Electronics is going to invest $27.7 billion (30 trillion KRW) to build its second semiconductor plant in Pyeongtaek, which will be the biggest semiconductor plant in the world just like how the first plant in Pyeongtaek is. This move is drawing attention from surroundings as this is a first huge investment decision made after Vice-Chairman Lee Jae-yong was released from a detention center. According to industries, Samsung Electronics is going to hold a management committee in the morning of the 7th and officially approve investment for second semiconductor plant in Pyeongtaek, which will be completed by the end of the first half of 2019. 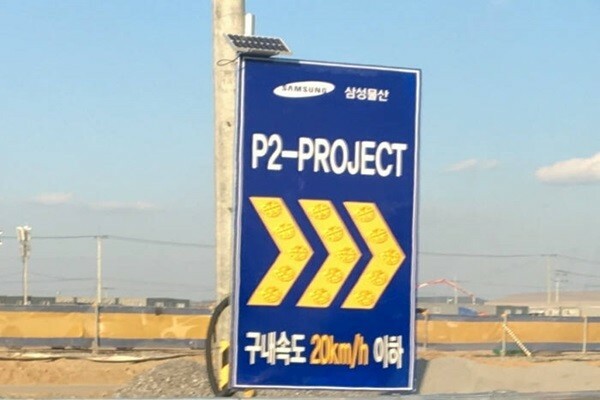 Samsung C&T obtained an order from Samsung Electronics’ DS (Device Solution) Division regarding the construction of this plant earlier this year and started establishing a foundation near the first plant in Pyeongtaek under a project name ‘P2-Project’. Gas pipe companies such as WONIK Holdings also obtained orders from Samsung C&T last month regarding construction of gas pipes. It is expected many of Samsung C&T’s partners will obtain orders regarding construction of this plant. “Because this investment is made in order to respond to semiconductor demands on right time, we are going to finalize our decision on products, size of investment, and timing of operation after looking at situations of markets.” said a representative for Samsung Electronics. Some industries believe that Samsung is starting to make aggressive management after seeing that Samsung made an announcement on large-scale investment right after Vice-Chairman Lee was released. However, Samsung Electronics drew a line by saying that this is an issue separate from Vice-Chairman Lee being released and that it has been discussing with Pyeongtaek-si and construction companies since end of last year. Since 2010, Samsung Electronics has been constructing plants in advance in order to prepare for semiconductor markets that have been changing very quickly. It has been preparing cleanrooms in advance and producing necessary items whenever they are necessary. Samsung Electronics explained that this second plant in Pyeongtaek will also be constructed based on this point of view. Industries are filled with expectations that Samsung Electronics will be making more investments into semiconductor this year than last year as they hear the news about Samsung Electronics making investments into a second plant in Pyeongtaek. It is heard that Samsung Electronics will make lesser facility investments than last year ($40.1 billion (43.4 trillion KRW)) when it made the most facility investments ever in Samsung history. However just by looking at semiconductors and not displays, amount of investments in 2018 can be more than amount of investments in 2017. “Looking at entire semiconductor investments such as construction and extension of Samsung’s new plant in Hwasung, investment for the second floor of its first plant in Pyeongtaek, construction of its second plant in Pyeongtaek, and investment for its second plant in Xi’an, it is likely that amount of investments into semiconductor businesses in 2018 will be bigger than the amount of investments into semiconductor businesses in 2017.” said a representative for an industry. It is likely that the second plant in Pyeongtaek will be completed by the end of the first half of 2019 and go on a regular operation during the second half when equipment will be brought in.